ISBN 9781585602131. With Text Language: English. Method. No one likes every style of music, but everyone loves the sound of the five string banjo. The pleasantly addictive twang of the instrument is unmatched in its ability to generate smiles and happiness. And the experience is even more fun when you're the one making those sounds. In the hands of a capable player, the banjo is a virtuoso instrument with a broad expressive range. An uptempo breakdown, a snappy jig, a plaintive blues, a pretty gospel song - - each different in its own way, but all equally at home on the banjo. For nearly half a century, Roy Clark has been counted among the kings of the five string banjo. From the National Country Music Banjo Championship in 1948 and 1949 to 25 years as co-host on the popular television show "Hee Haw," Roy's banjo wizardry has long thrilled millions of devoted fans. Historically speaking, it would simply be impossible to name another person who has done more to advance the popularity of the five string banjo. You, too, can experience the joy of playing the banjo with the help of Roy Clark's Bluegrass Banjo Bible . Roy's "information packed" instruction book published by Santorella Publications is loaded with informative lessons and great bluegrass tunes. 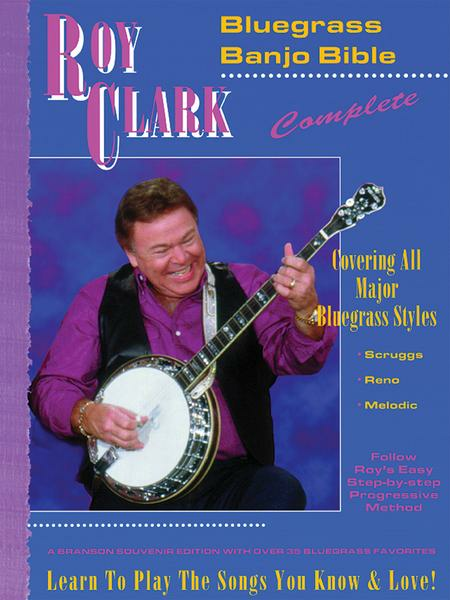 Roy Clark's Bluegrass Banjo method follows a logical, step by step approach that promotes systematic, efficient and enjoyable learning. This comprehensive, professional approach is sure to contribute to your musical versatility and growth in the years to come. Includes all these Bluegrass favorites; All The Good Times Are Past And Gone - Amazing Grace - Aunt Rhody - Aura Lee - Barlow Knife - Belmont County Blues - Bill Cheatham - Blackberry Blossom - Boil Them Cabbage Down - Comin "Round The Mountain - Cripple Creek - Devil's Dream - Dixie - Down In The Valley - Eighth Of January - The Gillespie's Hornpipe - Groundhog - Joys Of Wedlock - The June Apple - Liza Jane - The Midnight Special - Old Joe Clark - Red Haired Boy - Red Wing - Sally Ann - Shady Grove - Skip To My Lou - Soldiers Joy - Sourwood Mountain - Spanish Fandango - Thinkin' About Blue Eyes - Three More Rivers To Cross.